Introduction. 2. Physical Properties of Soil. 3. Gas Diffusion in Soil. 4. Soil Temperature and Heat Flow. 5. Water Potential. 6. Hydraulic Conductivity and Water Transport Equations. 7. Variation in Soil Properties. 8. Infiltration and Redistribution. 9. Evaporation. 10. Solute Transport in Soils. 11. Transpiration and Plant- Water Relations. 12. Atmospheric Boundary Conditions. Appendix. Index. No responsibility is assumed by the author or publisher for any errors, mistakes, or misrepresentations that may occur from the use of these programs. This book covers material taught in a graduate-level soil physics course at Washington State University. While most soil physics courses dwell mainly on deriving rather than solving the differential equations for transport, the author's approach is to focus on solutions. Graduate students in agricultural and biological sciences usually have a good working knowledge of algebra and calculus, but not of differential equations. In order to teach methods for solving very difficult differential equations with difficult boundary conditions using fairly simple mathematical tools, the author uses numerical procedures on microcomputers to solve the differential equations. Numerical methods convert differential equations into algebraic equations which can be solved using conventional methods of linear algebra. This book reflects the philosophy used in the course. 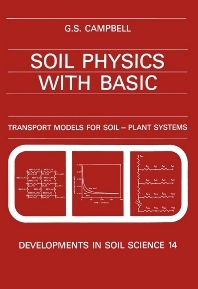 Each chapter introduces soil physics concepts, generally in the conventional way. Most chapters then go on to develop simple computer programs to solve the equations and illustrate the points made in the discussion. Problems at the end of each chapter help the reader practice using the concepts introduced in the chapter. The problems and computer programs are an integral part of the presentation, and readers are strongly encouraged to experiment with each model until both the working of the model and the concepts it teaches are familiar. Although the programs are generally short and relatively simple, they are suitable for use as submodels in large, general-purpose models of the soil-plant-atmosphere system, and have been used in this way by the author and by several of his students. Teachers and students alike will welcome this new textbook. It will enable graduate students to understand and solve transport problems which exist in field situations, and will provide them with a good working knowledge of soil physics - fundamental to so many other areas in soil, plant and engineering sciences.